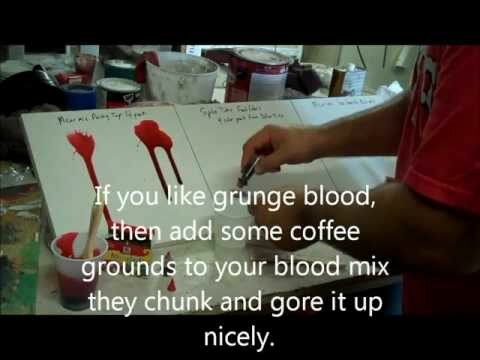 I need a dry but wet looking blood recipe I can use on props like a table or even on my foam latex. Does anyone have any ideas? I was thinking some type of shellac or polyurethane? For rich dark blood use a lot of the red food coloring so you have plenty of pigment, and then add green and you can get a near black blood with a red tint. Green does a great job darkening red without shifting the color. As you mix your pigment I suggest using your mixing stick and smearing some of the blood mixture along the inside edge of the cup to see how it looks when thinned. It may look great in a large thick volume, but once spread out you can get a good idea of how translucent it will be and where the color value is. I'm not super familiar with Unit 70, but I'm pretty active in the Halloween and Haunted Attraction world, so I'm sure I've seen some of their stuff at a convention/tradeshow or in the wild. Their work looks great. But in short, the best formula that I've found is clear glue (like Elmer's clear school glue, not their white glue) mixed with plenty of red food coloring that is darkened slightly with a bit of green food coloring. You can adjust the color as desired by mixing in other colors such as yellow or blue, but I would be careful with blue as it shifts the red to purple rather than just darkening it. Once that mixture dries it still looks wet, but does not rub off. It also has a bit of flex to it, which is great for wardrobe. 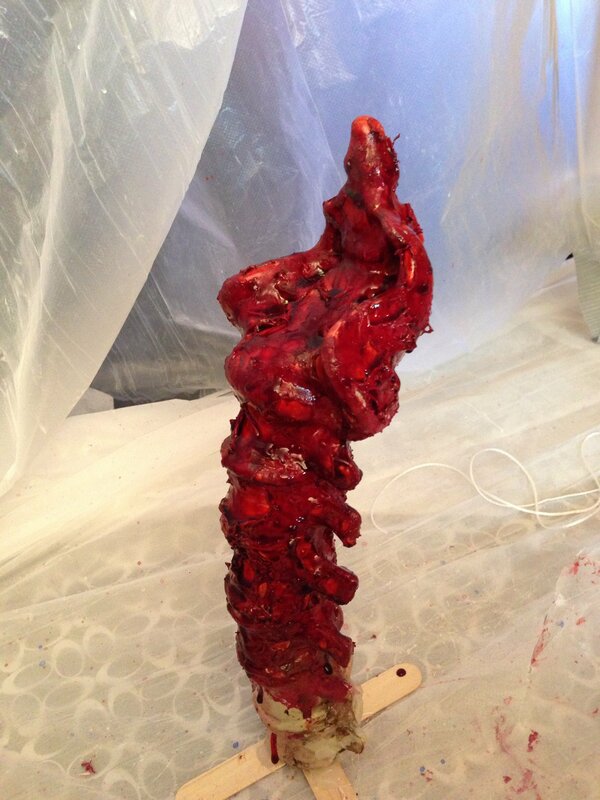 Here is a zombie rod puppet I used that type of blood on. There are also companies that make this type of blood commercially. 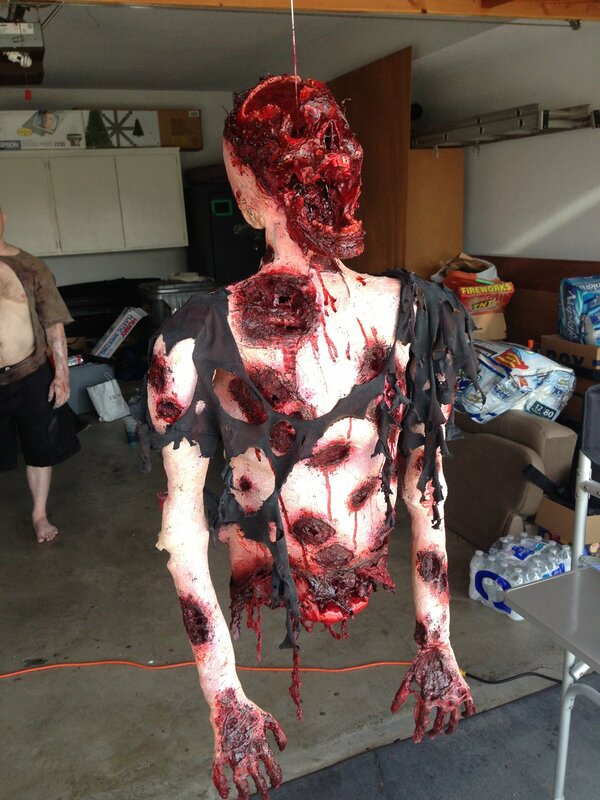 And Rip City FX makes a similar product called "Haunt Sauce" that is a little cheaper. Thanks Chris that is what I was trying to duplicate the perma blood type solution. 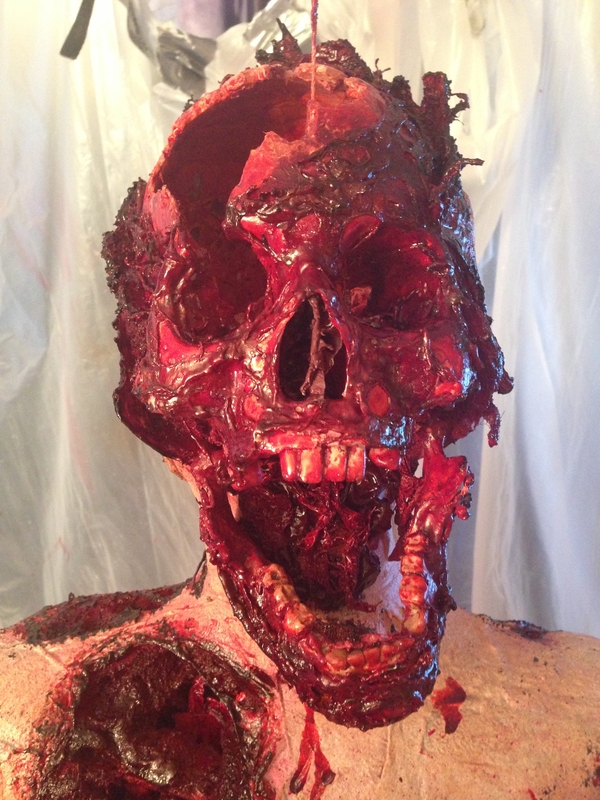 Not sure if you have ever seen the blood a prop company called unit 70 uses on their props but it is very good very dark almost black in some areas. It maybe this but just tinted differently.